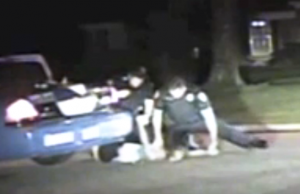 TALLAHASSEE — Shocking video evidence shows how Tallahassee police officers used an unprovoked act of violence against a woman they were arresting for driving under the influence. In front of their own dashboard camera, without any legitimate provocation, two officers drilled a woman face-first into the road, then knelt on her head, causing startling physical trauma. In the early hours of August 10, Tallahassee police arrived at the scene of an alcohol-related accident. The suspect, 44-year-old Christina West, was put through field-sobriety testing and determined to be intoxicated. During the arrest, the inebriated woman flailed her arm as the officer attempted to handcuff her. “DON’T YOU F***ING TOUCH ME,” Officer Chris Ormerod roared. The officers are then seen forcefully slamming the 5′-6″, 130 pound woman face-first to the hard ground, followed by a giving her a gratuitous knee to the back of her head, exacerbating her facial trauma. She can be heard screaming in pain as she is being pressed into the road by two male assailants. Officer Ormerod continued to press her face into the ground with his arm. West was arrested on a charge of DUI and several counts of battery on a law-enforcement officer, according to Tallahassee.com. Florida State Attorney Willie Meggs said he was shocked by brutality of the officers, and will not prosecute West for battery on a police officer. "I am extremely upset," he said in an interview with the Tallahassee Democrat. "It is very disturbing. This is a very disturbing situation to me, and I'm dealing with it." After being hospitalized, West was determined to have suffered a broken orbital bone, a swollen eye, bloody nose and cuts to her arms and legs. Arresting Officer Chris Ormerod excluded details from his written statement, according to Tallahassee.com. Ormerod wrote that West was "placed on the ground" after resisting being put in handcuffs. He omitted the part where she was bent over his vehicle and then body-slammed to the road, followed by a crushing knee to the head. Tallahassee Police Chief Dennis Jones has opened an investigation. No comment on the future employment of the officers. The video speaks for itself. The use of force was brutal and unnecessary. TPD needs to purge its ranks of officers who commit such unprovoked assaults. Instead of charging West with battery, it would be more appropriate to charge Officer Chris Ormerod. Police State USA is a volunteer, grassroots alternative media outlet dedicated to exposing the systemic formation of an American police state. Our mission is to educate and inform the public about issues that endanger our rights and liberties, and work to fix them through non-violent means.